Microsoft’s Herb Sutter is a whirling dervish. Since the ISO approval of the C++11 standard last fall, he’s been on a crusade to promote C++ via several comparative assaults on Java and Microsoft’s own C#. 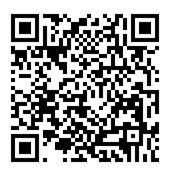 Herb’s latest blitzkrieg occurred at the lang.next 2012 conference (video link, slides link). 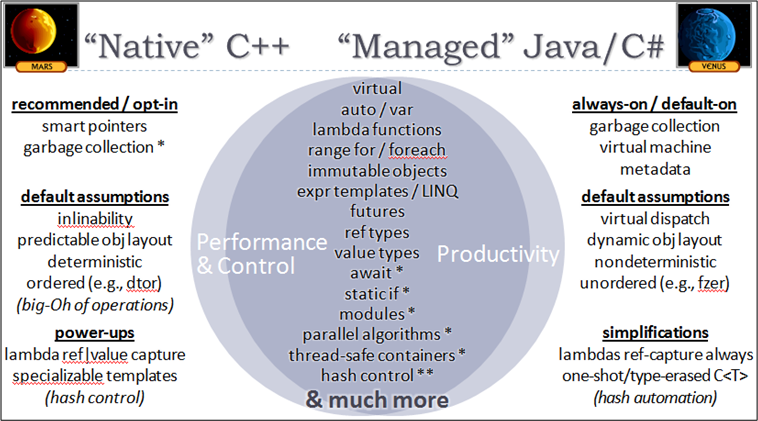 In this slide, Herb summarizes some of the C++11 features that close the productivity and safety gap relative to C# and Java. In this next slide, Herb contrasts C++11’s adherence to its more open “trust the programmer” philosophy against the more closed “we know what’s good for you” C#/Java philosophy. 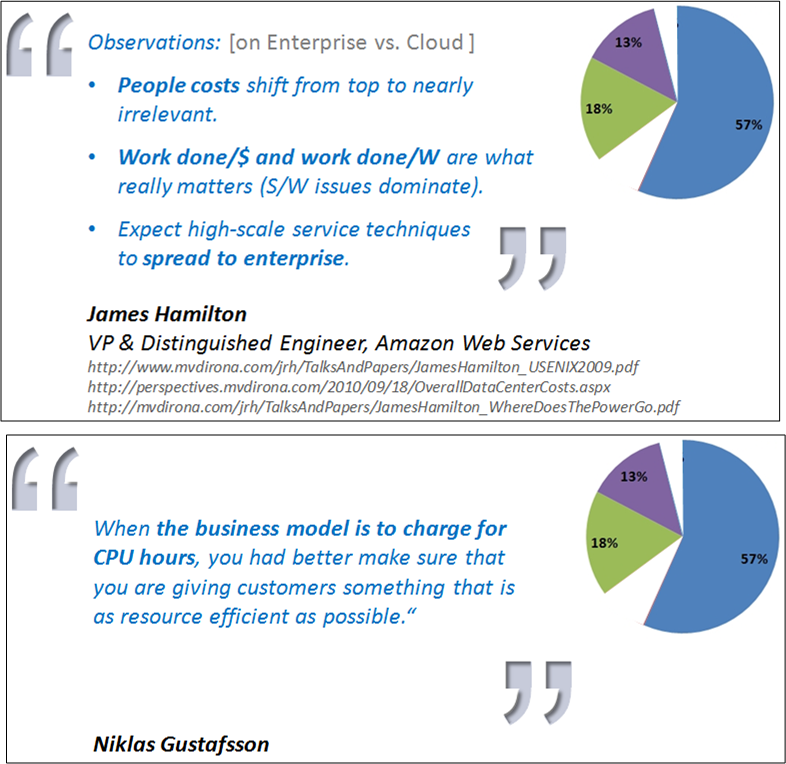 Unless the large movement of business applications to the cloud is the latest fad du jour, the following two slides show that the largest software development and maintenance costs will shift from labor to compute efficiency. Thus, it doesn’t matter how programmer friendly your language is and how low the salaries you pay are, you might find that your costs are going up because of power drain in massive data centers and time spent frantically optimizing VM-based code that’s relatively slower and bigger. Is Herb stretching the truth and exaggerating the improvements offered up by C++11? The fact that I wrote this post obviously means that I don’t. What about you, dear reader? What say you? Firstly I’ll just say that there is certainly something in the last slide. There are always going to be small scale applications which run easily on any modern (desktop) hardware and in these cases developers may as well take the easiest route. C++ is certainly my language of choice (my interests right now are primarily multimedia and game applications, plus some robotics when my Raspberry Pi arrives). Moreover, the new standard has taken away a lot of the things managed language proponents had to complain about. I think there’s still a place for managed languages, but it seems to be becoming ever smaller. 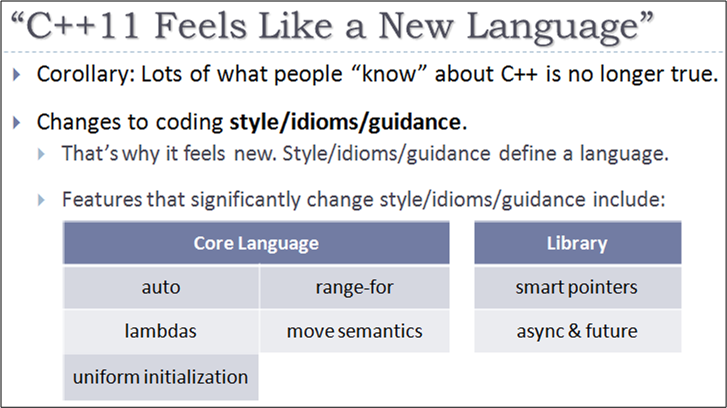 One interesting language not mentioned in the presentation was D. I’m yet to get the chance to learn it, but it appears to be (at least in theory) an “easier” C++ while retaining the power and performance. What are your views on D? Thanks for the insightful comments. I love Walter Bright and (especially) Andrei Alexandrescu. Thus, I love D. I think D is what C++ would have been if it didn’t have the goal of maintaining relatively staunch alignment with C.